ww2dbaseAlpo Kullervo Marttinen was born in Alatornio, Finland to Albin Marttinen and Lovisa Kuitunen in 1908. He began his military career in 1927 and was commissioned a junior officer in the Finnish Army Reserve in 1928. He served as an instructor in the Army Academy between 1933 and 1934. When Finland entered WW2 in 1939 with the outbreak of the Winter War, he was a staff officer in the Kemi Military District in his home region of Lapland. He spent most of the Winter War as 9th Division commanding officer Hjalmar Siilasvuo's chief of staff. After the end of the Winter War, he held staff posts. 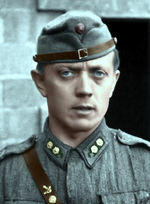 During the Continuation War, he served successively with the 17th Division, the 61st Infantry Regiment, and then once again as Siilasvuo's chief of staff. In Sep 1944, an armistice was signed between Finland and the Soviet Union. Fearing a Soviet occupation, many Finnish officers began hiding caches of light infantry weapons around the country in preparation for a possible need for a war of resistance. Marttinen, as a colonel in the Vaasa Military District, took part in this effort. In the spring of 1945, intelligence of this effort began to leak, resulting in the Weapons Cache Case. He fled Finland before he could be arrested and tried. He went to Sweden with the help of his former subordinate officer Harry Järv. In 1946, he and his family moved to the United States. In 1947, he and a band of his former subordinates offered their services to the US Army, becoming trainers of winter warfare. In 1950, Marttinen graduated from the US Army Command and General Staff College. In 1951, he was given US citizenship. In 1963, he graduated from the US Army War College. During his US Army career, he served in the United States, West Germany, and South Korea. He retired from the US Army at the rank of colonel in 1968, and then went to Iran to serve as a military adviser until 1971. He passed away in Falls Church, Virginia, United States in 1975. He was buried at Fort Leavenworth National Cemetery in Kansas, United States. ww2dbaseHis wife Lea Mirjam Järvenpää passed away in the United States on 23 Nov 2007. 4 Nov 1908 Alpo Marttinen was born in Alatornio in northern Grand Duchy of Finland, Russian Empire. 30 Aug 1928 Alpo Marttinen was promoted to the rank of 2nd lieutenant in the Finnish Army Reserve. 16 May 1930 Alpo Marttinen was promoted to the rank of 2nd lieutenant in the regular Finnish Army. 22 Apr 1932 Alpo Marttinen was promoted to the rank of lieutenant. 16 May 1938 Alpo Marttinen was promoted to the rank of captain. 9 Nov 1940 Alpo Marttinen was promoted to the rank of major. 10 Nov 1941 Alpo Marttinen was promoted to the rank of lieutenant colonel. 30 Oct 1942 Alpo Marttinen was made the commanding officer of 61st Regiment. 23 Jun 1944 Alpo Marttinen was promoted to the rank of colonel. 7 Oct 1944 Alpo Marttinen stepped down as the commanding officer of 61st Regiment. 20 Dec 1975 Alpo Marttinen passed away in Falls Church, Virginia, United States.